The Great Miketendo64 Egg Hunt Begins! Hey everyone! We at Miketendo64 are celebrating quite a big milestone today. We have just published our 500th Nintendo Switch review and to celebrate, we are hosting an Easter Egg hunt right here on our website! 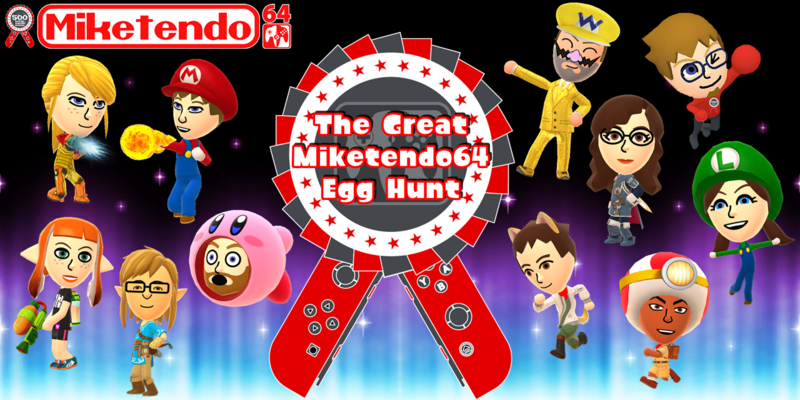 The Great Miketendo64 Egg Hunt is now in full swing if you would like to participate for a chance to win a Nintendo eShop card. There are eleven Mii characters hidden somewhere on our website, though willing participants will only need to find five. After finding five characters, you will be prompted to fill in a form to enter our draw via Gleam. Winners will be chosen at random on September 7th. To help out, we will be posting clues every now and again to the bottom of this post that should point you in the right direction. To start off, our very own It’s A Me, Mario! is going to show you where you can find the first clue. Clue #2: Every now and then, we like to voice an opinion of something we’d like to see happen in a certain Nintendo game and this month, we were talking about DLC for Mario Kart 8 Deluxe and Xenoblade Chronicles 2. Clue #3 A Metriod Movie isn’t a bad idea. Clue #4 Wario was here to give a certain Review a Golden touch. Clue #5 Damn Octolings, how dare they escape the Deepsea Metro and make it to Inkopolis? We wonder what issues they had to face while they were down there. Clue #6 Which game is better, Fire Emblem Warriors or Hyrule Warriros: Definitive Edition? Having asked you guys that, we were all too happy to share the results. Have you seen them yet? Clue #7 It’s hard trying to keep up with all cool Nintendo developed and/or published games, coming to Nintendo platforms this year and the next, but that’s why we have a guide that keeps track of them all! Clue #8 For a good time, why not try Celebrating with Kirby and his All-Star Allies? Be sure to take a Picture or 12. Clue #9 Link loves the colour blue and his new shirt is everywhere. Good thing there’s a gallery so you can see them all in one place. Clue #10 First it was Mario joining forces with Rabbids and now Fox is off on a galactic adventure thanks to Ubisoft. Starlink: Battle for Atlus is bound to impress and did we mention the fact we played it recently? That’s all the clues folks! We wish you well in your hunt. If you can find five, you will be in for a chance to win one of four Nintendo eShop cards. The real test is can you find all eleven? and also good luck everyone! Good luck to you and enjoy the hunt! Thank You! Good luck on the hunt !